Tom Alig grew up an athlete. In addition to playing baseball, basketball and football, he also been a lifelong runner - even completing two full marathons. But in his mid-forties, he was sidelined by injury. Without his usual outlet, he turned to alcohol. "Alcohol ended up kind of taking control of my life," said Alig. "It became all day and all night." Alig said his alcoholism took his family, his job, pretty much everything. In February, Alig found himself on the streets for two nights. "Took a walk and God led me here to the Rescue Mission," Alig said. There, Alig began a yearlong recovery program. In July, he had an opportunity to rediscover the athlete in him. 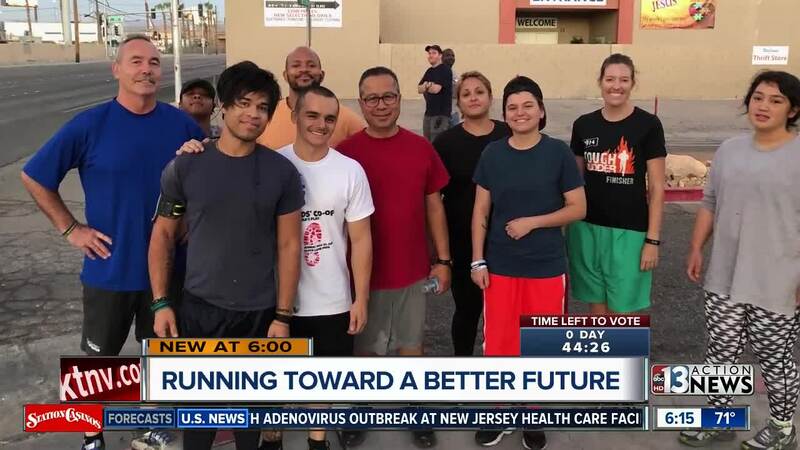 The program Up and Running Again was coming back for another season - giving residents in recovery a chance to take part in a 13-week training program, which would culminate in a race - the Rock n' Roll half marathon. Alig joined 26 others for several runs a week - starting slow and building endurance along the way. Each Saturday, the group took a trip to another area of the Valley for longer runs. Kenneth Collins said he's learned to tough out the worst part of running. "Every part of me just wants to bail at first, but then after you get going, a few minutes in, it feels really natural, it feels good," Collins said. On Sunday, Collins will join six runners, who've remained in the program, for the race. Fellow runner Anthony Petcoff said he's learned to see running as a metaphor for life. "I'd wake up some mornings and not want to do it," said Petcoff, "but I'm so glad I did. It's probably going to be just like life. Sometimes you don't want to do the right thing but you have to do so you can do what you want to do." Petcoff, who came to Las Vegas Rescue Mission from prison, said his goal now is to return to school and become a substance abuse counselor. Since beginning his recovery program in February, Alig said he's been able to complete the program and regain parts of his life he had lost. Last month, he was hired full time by Las Vegas Rescue Mission as a case manager. "Between the Las Vegas Rescue Mission, the Up and Running Program and the grace of God, I now have a new bounce in my stride," Alig said. "A new lease on life." Up and Running Again pays for runners' race entries and team shirts. Runners have the opportunity to earn new running shoes by consistently participating in the program through training. Las Vegas Rescue Mission is sponsoring a water station for Sunday's race. If interested in volunteering, contact Heather Williams at hwilliams@vegasrescue.org.